Organization accounts often include many subgroups with numerous users that upload and analyze documents. To assess the success of plagiarism prevention measures and establish a culture of credibility is an ongoing process that needs to be tracked. Now this process can be visualised with our new Usage Statistics Beta. This feature offers valuable insights into the current state of each student’s attitude with regards to Academic Integrity - and how it develops over time. 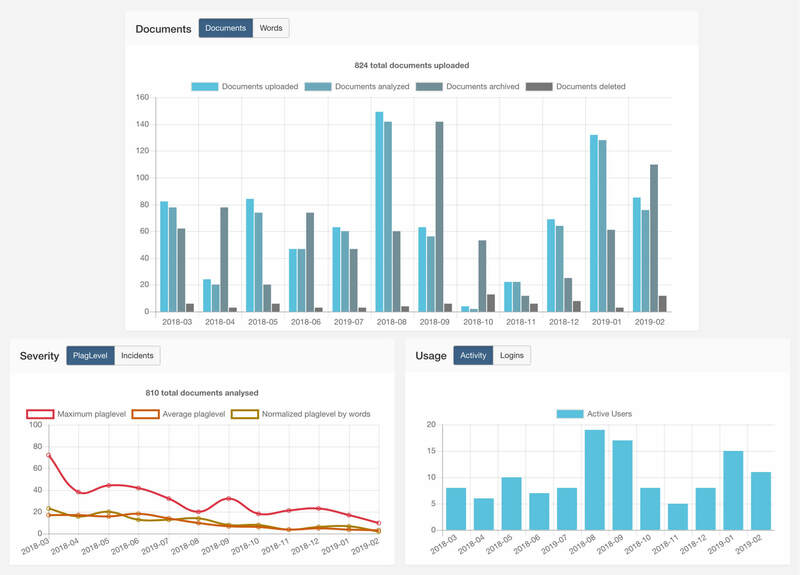 Track the Success of Anti-Plagiarism Measures with PlagScan's "Usage Statistics and Analytics"
Every organization is different and so is their focus when it comes to analyses and reports. The Usage Statistics feature is divided into different sections, focusing on different aspects of the usage and findings PlagScan’s software. To analyze trends and developments, time frames can be chosen and looked at sequentially. When looking at statistics in order to improve certain academic circumstances, it is important to get an overall view on the situation first. The Organization section of the feature provides you exactly with this kind of data. The data will be displayed in three different sections with different emphasis: Severity, Documents, and Usage. After getting an overview of the situation for the organization in total, it may be interesting to learn if there is an equal distribution of infringements of Academic Integrity. This feature offers the ability to look deeper into Groups statistics, which include Assistants, Instructors, and Students. This overview enables those that are responsible for safeguarding Academic Integrity to focus their efforts on activities such as plagiarism prevention workshops for specific groups or classes. It is always good to discuss and share the finding of usage statistics and analytics with the organization’s stakeholders, administrators, and instructors. Usually, the statistics insights will need to be discussed in a larger group and therefore they will need to be exported. For this reason, PlagScan is working on graphs which can be exported and shared as an image using pdf and other common image file formats. Please Note: Usage Statistics are under active research and the feature is currently in beta stage of development. While preliminary testing indicates promising results, we are still refining the product and developing guidelines for users to achieve optimum accuracy and performance. Your feedback helps us improve. If you experience any disruptions or unexpected results while running the software, please contact us to tell us about it.